Of all the industries that need a good self storage facility, perhaps none have a greater need than theatre and film. 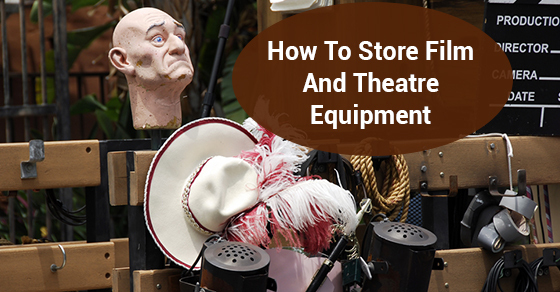 With all of the costumes, props, pulleys, curtains and other items necessary to put on complicated stage productions, theatre companies need space to store all of that stuff when it is not being used. If you are thinking about placing film or theatre items into storage, below are some tips for keeping them safe and secure while they are not in use. Costumes, like any expensive clothing, should be dry cleaned, put in garment bags that breathe, and stored in well-ventilated, professional quality wardrobe boxes. This is especially true for costumes that use natural textiles like wool or cotton because they are prone to insect infestations and destruction. Because of this vulnerability to pests, natural textiles should also have a natural insect repellent introduced (such as dried lavender or cedar shavings) for some added protection against pests. Furniture and other wooden props are going to need a climate controlled storage space to ensure that they don’t become victim to humidity, mold and mildew over time, and end up becoming unusable. Theatre props and furniture are often custom made and cost a lot of money. Having to constantly replace expensive props and furniture is a good way to put a theatre company out of business. Film for motion pictures is made of various different materials, and requires various storage tactics. One thing that all film has in common, however, is that it requires a climate controlled storage unit. Film should be stored at 30-50% humidity, a level that is generally exceeded in the summer, so climate control is a must. Film should always be stored away from vents, in protective enclosures that are light-proof and physically protect the film. The film should also be wound tightly (though not too tight). The key to success for film and theatre is creating a depiction of life that draws audiences in and keep them captivated. To do this, these industries need clothing and props with a specific look and feel, so these things need to be kept in perfect condition. If you are planning to store your film and theatre items in a self storage unit, keep the above considerations in mind, and ensure they are preserved in as good condition as the day you put them away.